I am a 44 yr old male, who has played both outdoor and indoor soccer for most of my life. More recently, I had surgery to repair/reconstruct a ruptured Achilles tendon a year ago - almost to the date, (I was playing indoor soccer when it happened). For the past 12 mos, I have been recovering, rehabilitating, and just got to where I can run a slow jog for a short distance. It was a successful surgery, but very painful experience, (I don't recommend it to any of you older guys who are still playing!). I doubt that I will step back on the field again, (at least not on a competitive level). 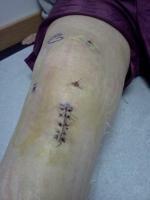 But, about two weeks ago, I began noticing that my right knee was giving me some considerable pain. No swelling, but very sore and moderate pain when I walked. Now, since I have played soccer most of my life, I have injured and/or strained every other muscle, tendon and ligament in both of my knees at some point in time...BUT never experienced this kind of knee pain before. My trip to the ortho last week - turned into a kick in the pants, that I wasn't expecting. Based on the physical examination, I may have torn my ACL at some point since my Achilles tendon surgery last October. MRI done same day, but results not back yet. The question now is, (if the ACL is torn - which my gut tells me - it is! ).....should I have the surgery? (Apparently this is an option for "older guys my age"). I have always been very active playing & coaching soccer. I do work out, and I do like to scrimmage with my girl's team...and play co-ed for fun. Will I still be able to retain this level of physical activity if I elect NOT to have the surgery? Are there any ex-soccer players out there - who are in the same age range, that elected to have the surgery, or didn't, that give their recommendations/suggestions? I only mention my Achilles surgery because - after what i've been thru with that - there is no hesitation on my part to have the ACL surgery, IF I need to have it in order to maintain my physical activities.